I met a young Guatemalan couple at the grocery store. The young man, E., was fair-skinned and dark-haired. The young woman, D., was exceptionally short and had the brown skin of indigenous Mayans. 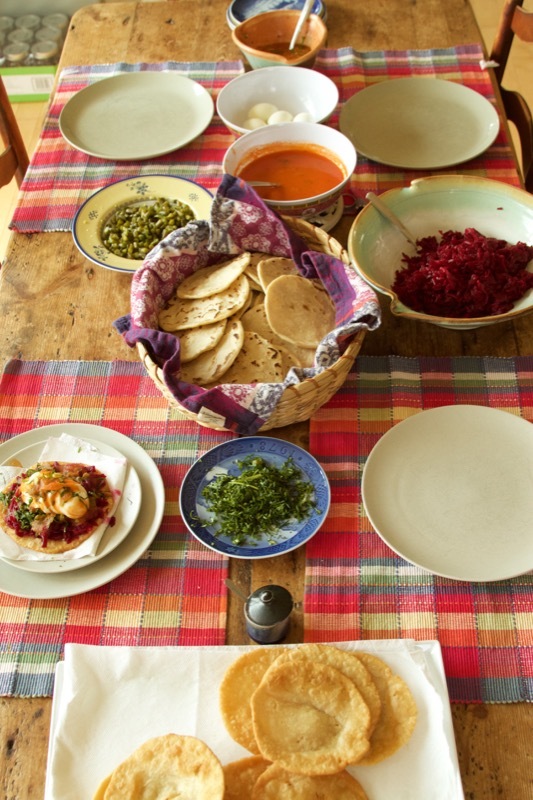 I asked E. and D. if they’d teach me how to cook their favorite Guatemalan meal from home. To my delight, they said yes. They grew up living in wooden huts on subsistence farms about ten miles from each other in the mountains of El Quiché, raising chickens, cows, and goats, and growing vegetables. From the age of two or three, D. worked with her mother to form tortillas by hand. They made the dough out of corn that they had grown, cut off the cob, soaked in lime, hulled, rinsed, and ground. By the age of 11, D. was cooking the tortillas for her family by herself on the comal, a round flat griddle. Now, at the age of 24, her hands move as fast as a hummingbird’s wings as she turns and pats each ball of dough into a disc. She guesses she can make about 60 tortillas an hour. Each tortilla is amazingly perfect: round, flat, smooth, a quarter of an inch thick, and soft. But why would you need that many tortillas? I wonder. E. explains that typically about twenty family members gathered for each meal. In his case there were ten siblings, his parents, and many nephews and nieces. They ate tortillas as part of breakfast, lunch, and dinner. Their tortillas were usually purple, not cream colored, because they were made out of a purple variety of corn. If each member of the family had three tortillas per meal, I realize, the family cook would be making 180 tortillas per day. In my kitchen, while D. is filling up a basket of steaming tortillas, E. is sharpening my knives using a technique his father had taught him. Then he breaks down a whole chicken with ease, whacking through the bones with graceful authority. Three hours later, an appetizer emerges: fried tortillas topped with a grated beet salad, diced green beans, slices of hard-boiled egg, and chilmol, a red sauce made of boiled and blended fresh chilis and tomatoes, onions and chicken broth. Next they serve giant bowls of country-style soup with large chunks of bone-in chicken, carrots, onions, potatoes, tomatoes, and chopped herbs. To go with the soup they serve a spicy mash of cooked fresh tomato and chili pepper; lime wedges, and of course, tortillas. E. rips two into pieces and submerges them in his soup. Three years ago, E. and D. had a baby in Guatemala. It became apparent that they needed a home of their own. They estimated that they’d need 80,000 quetzals (about $10,400) to buy land and build a humble house in their area, which was getting more and more developed. The only job E. could find was chauffeuring. Working morning to night, he would earn the equivalent of $7 or $8 dollars per day. A cousin living in the United States suggested they work in the U.S., make what they needed, and go back home. E. and D. decided to try it. They left their son with E.’s parents, walked for 45 days from Guatemala into Texas, surviving 21 days in the desert with only water – no food. They rode a bus to his cousin, who helped him get a job as a cook in a restaurant. E. and D. miss their son dearly, but – so far, so good – they are saving money for a home.